Createspace Independent Publishing Platform, 9781983777271, 68pp. "If you're looking for something tart to cut the holiday sweetness, Shaffer offers a naughty little treat." 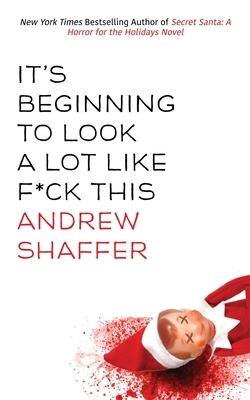 - The Gazette "It's Beginning to Look a Lot Like F*ck This" is an off-beat collection of Christmas parodies, essays, poems, and cartoons by New York Times bestselling humorist Andrew Shaffer. Previously published as "The Shelf on the Elf," this newly-expanded holiday cult classic has it all: holiday pickles, regret, talking lambs, and knife-wielding maniacs. Andrew Shaffer is the New York Times bestselling author of the essential survival guide, "How to Survive a Sharknado and Other Unnatural Disasters," and the Goodreads Choice semifinalist "Fifty Shames of Earl Grey." He has appeared as a guest on FOX News, CBS, and NPR, and has been published in McSweeney's, Mental Floss, and Maxim. An Iowa native, Shaffer lives in Lexington, Kentucky with his wife, novelist Tiffany Reisz.